Hitman Pro is a complex security application capable of detecting and removing a wide variety of digital threats by using multiple anti-spyware and anti-adware programs. 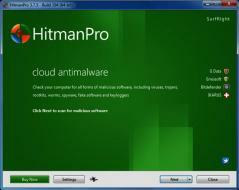 Hitman Pro is using extensive Behavioral Analysis and innovative Cloud Computing techniques to detect and remove malware threats with a minimum system footprint. Unlike in the previous versions of Hitman Pro, the latest one doesn’t install third-party anti-spyware and anti-adware on your computer. Hitman Pro detects all the files with suspicious behavior and sends them to the scan cloud using the Internet connection. There, the program removes any detected malicious files, thus not crowding up your computer with a large number of programs that could affect its performance. The speedy scanning process is facilitated by a whitelist that includes Windows system files and other safe files commonly found on PCs.